Back when John Liscio was alive, we used to joke with him about using a New York Post style headline, “Job shocker!” This month’s report would qualify. • Employers added 312,000 jobs in December, 301,000 of them in the private sector. The headline gain was 122,000 above the average of the previous three months, even after the upward revisions to October and November. Though it looks giant by recent standards, the monthly gain in percentage terms was only at the 60th percentile of all months since 1950. It looks better if you start the clock at 1980: then, December’s gain is at the 73rd percentile. Over the year, total employment was up by 1.8%, the highest since 2016. It had been sagging through 2017 and early 2018, but has largely recovered. • November’s gain was revised up by 21,000, and October’s by 37,000. The combined total of 58,000 largely came from concurrent seasonal adjustment distributing December’s “surprise” backwards. Before seasonal adjustment, the combined gains in October and November were revised up 12,000; adjustment pushed that up to 58,000. • Unsurprisingly, diffusion indexes were strong, with all intervals up to levels not only above their 2017 averages, but above the mighty 1995–2000 averages as well. • The workweek rose 0.1 to 34.5, its level for eight months of 2018. • Average hourly earnings were up 0.4% for both all workers and nonsupervisory workers. For the year ending in December, the all-worker series was up 3.2%, matching October; the latest readings are the highest we’ve seen since 2009. No major sector showed a decline, and a couple were quite strong, notably retail, up 1.1% for the month and 5.0% for the year. • The household survey was less exuberant. Total employment was up 142,000. When adjusted to match the payroll concept, household employment was up a more modest 180,000. On a yearly basis, which is a much better way to look at this volatile series, adjusted employment was up 1.8%, exactly in line with its payroll counterpart. Employment growth lagged the increase in the labor force, which was up 419,000. Consequently, the participation rate rose by 0.2, to 63.1%, its highest level in nearly five years, but the employment/population ratio was unchanged at 60.6% for the third consecutive month. Part-time employment was up by 159,000, though all of it came from the willing, up 305,000; those working part-time for economic reasons fell by 146,000. Unwilling part-timers accounted for 3.0% of employment, which is pretty much where the share has been since June. • The number of unemployed rose by 276,000, and the rate rose 0.2 to 3.9%, its highest level since June. Because of separate seasonal adjustment, the component of the unemployed don’t add to the total, but voluntary leavers, a proxy for the quit rate, accounted for a big chunk of the increase, though the strong message of that number was countered by a relatively large number of permanent job losers. All durations of unemployment showed an increase except the very shortest, less than five weeks; the median and mean durations both rose 0.1 point, though they’re still at the low end of their recent ranges. The broad U-6 rate was unchanged at 7.6%. It’s up 0.2 since August. • The age distribution of employment gains is curious. Given the volatility of the month-to-month figures in the household survey, we’ll look instead at changes for the year ending in December. Of the 2.9 million jobs gained over the year, nearly half, 49%, came from workers aged 55 and over, over twice their share of the workforce. Prime-aged workers, those aged 25–54, who account for nearly two-thirds of the workforce, or 64% to be precise, accounted for less than half the gains (45%). Their contribution was dragged down by the older group within that cohort, as the number of those aged 45–54 actually declined. Those aged 35–44 showed gains slightly smaller than their share of the workforce, while the youngest subgroup, 25–34, were up strongly. Also over-represented in the gains: older teens, those aged 18–19; just 2% of the workforce, they accounted for 11% of the year’s gains. • Job flows numbers lacked drama, with all categories showing little change. One bright spot: the three-month month moving average of the share of the unemployed dropping out of the labor force—a lingering blemish on the expansion—fell to just 1.1%, matching the series all-time lows, set in late 2000. Strong employment gains (at least in the establishment survey) and strong wage gains would normally excite some trigger fingers at the FOMC, though recent financial market turmoil might calm the itch (as Powell’s speech this morning suggests). With aspects of this expansion that look quite long in the tooth, you can’t not be impressed by these numbers. In our mid-November report, we noted that auto-industry expert Kim Hill pointed out at a recent conference that automobiles’ share of total sales had dropped five percentage points over the year, and that the average price had risen 3% over that same period, because of light trucks. 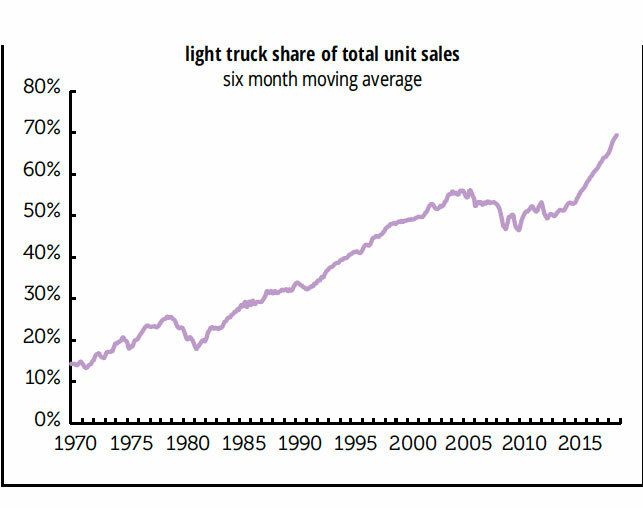 You can see that on the graph below, and also the, we’d say, shocking fact that light trucks were about 15% of total sales in 1970 and are close to 70% today. We’d like to give Kim a hat-tip for pointing out that within this trend auto jobs in nine states were at risk, with four plants in Michigan, six between the Great Lakes and the Gulf Coast in danger, and plants in California and Kansas possibly targeted. As we heard from a small percentage of those plants, we picked up the phone, and Kim immediately cut to the chase, highlighting two trends. First, “One of the ugly parts of this industry transformation is that you have a bunch of older workers who just don’t have the skills they need for the future.” Them’s harsh terms about “cutting out dead wood,” so they can hire the tech-savvy younger workers, and we all agree that that is a public policy issue. Kim says that General Motors has been looking at the plant in Ontario for a long time, and they are going to take some PR lumps for that because Canada and Ontario governments helped out GM during bankruptcy. Here in the U.S. they are contractually obliged with unions to give long leads when they are closing plants, so don’t pencil these layoffs into your forecasts yet. Kim thought there would be more shuffling of workers, and was surprised to hear about the outright closings, although he knew the risk was there. He also suspects that the two plants being scrutinized, one in Ohio and one in Michigan, will be whipsawed against each other, and the states will get involved in a kind of bribing process with lots of money on the table. As sales of sedans “fall off the table,” these shifts to truck-style products will continue. The auto-industry’s rule of thumb is that you’re safe if you take a multiplier of 7, that means 6 jobs for every direct job, for the industry overall. On the state level, that may fall to 4 or 5 because you are not picking up work generated outside the limited region, and if you look at the national level you can get up to a 10 multiplier for assembly plants because then you are picking up all the small suppliers and service firms throughout the country. Plants at risk include those in Lansing, Michigan, assembling Camaros and Cadillacs; in Lake, Orion assembling Sonic and Bolt; in Georgetown, Kentucky assembling all sedans; in Fairfax, Kansas, making Malibus; in Chattanooga assembling small utility vehicles—as well as the Alabama Hyundai plant, and the Mississippi Blue Springs/Tupelo Corolla plant. More to come and not as sweet as Tupelo honey. Many have reported that tariffs are a driving force in these plant closings, but Kim isn’t so sure. He didn’t refute our suggestion that tariffs may have been a deciding factor in the decision to shift employees between plants and outright closings, but he said there is too much in flux: many assembly plants might be able to absorb a 10% tariff but would choke on a 25% tariff, and it’s impossible to expect anyone to make a “massive industrial decision” without that information. It’s also very hard for decision makers to deal with “whimsical buyers driven by fuel prices.” Customers can turn on a dime, but manufacturers can’t. We’ll be featuring intermittent interviews with Kim Hill, so expect one in a few months when the effects of tariffs become clearer. The “platform economy”—Uber etc.—is a lot smaller than people think it is. And workers would pay good money for better working conditions. A lot of myths circulate about the contemporary labor market. One of the more durable is that we’re all day laborers now, working two temp jobs and driving an Uber on the side. As we showed back in June, BLS stats show that between 1.3% and 3.8% of all workers are contingent, depending on which definition you use, which are smaller shares than what prevailed in 1995 and 2005. In other words, hardly representative. But what about what the BLS calls “electronically mediated employment,” platforms like Uber and TaskRabbit? Internet and barstool chatter would have you believe they’re ubiquitous—not as a way of hailing a ride but as a major form of employment. Data released by the BLS at the end of September challenges this story. In fact, such platforms account for just 1% of total employment. And over a fifth, or 22%, of such workers are in the transportation sector, more than four times that sector’s share of total employment. Take those away, and the electronically mediated account for just 0.8% of employment. Some people find short, IN-PERSON tasks or jobs through companies that connect them directly with customers using a website or mobile app. These companies also coordinate payment for the service through the app or website. For example, using your own car to drive people from one place to another, delivering something, or doing someone’s household tasks or errands. Does this describe ANY work (you/NAME) did LAST WEEK? Since the BLS could compare responses to this question with respondents’ full answers to the CPS, they were able to discover a large number of false positives. For example, a banker, a cop, a professor, a motel desk clerk, a hairdresser, and a surgeon all answered “yes,” even though they shouldn’t have. The raw “yes” responses came to 3.3% of employment. But when the BLS recoded the answers to be consistent with the regular CPS questions, the share fell to 1.0%. For transparency’s sake, they report both sets of results. But given the rich comparative data provided by the standard CPS questions, the recodings look well-founded. 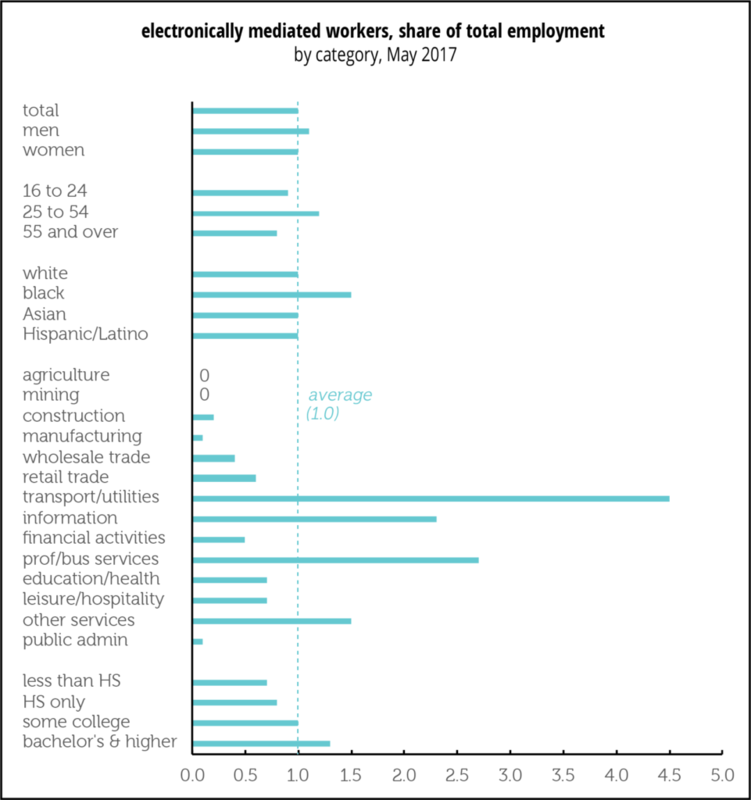 As the graph above shows, there were some variations by demographics and especially sector in the prevalence of platform employment. There was little gender difference. Blacks were somewhat more likely than others to be so employed. The share rose with education (and, although the graph doesn’t show these results, those with advanced degrees were more likely than those with bachelor’s only to do electronically mediated work). The biggest variations are by industrial sector, with almost no one in the goods-producing sectors or government working for an app. But 4.5% of workers in transportation and warehousing, 2.7% of those in professional and business services, and 2.3% of those in information were. These are not large numbers, even in transportation. They’re consistent with a new study from the JP Morgan Chase Institute, which is based on deposits into 39 million Chase checking accounts. It found 1.6% of the sample earning platform income in 2018Q1, up from 0.3% five years earlier. (If you’re the sensationalizing sort, you could say the share has quintupled, but it’s still quite small.) Two-thirds of that came from transportation. Over the course of a year, 4.5% of accounts showed some platform income, but most were for just a few months. Strikingly, despite the growth in platform work in transportation, from close to 0 in 2013 to 1.0% of the sample in 2018Q1, average monthly earnings in transportation were down by more than half, “even among the highest earning and the most regularly engaged drivers.” Earnings from selling (presumably names like Etsy and eBay, though neither the BLS nor Chase names names) and space rental (presumably Airbnb and the like) were quite small, with under 0.5% of accounts showing such income in a recent month. In months when families participate in the platform economy, such earnings account for just over half the month’s income—but other sources of income are clearly necessary. So, it looks like the platform economy can provide some income, but not enough to live on. And the steady influx of drivers into the likes of Uber and Lyft is driving down pay. As those who follow our work know, we have frequent, detailed discussions with senior revenue officials around the county on a regular basis. Withheld receipts are better tied to ordinary wages than are overall Personal Income Taxes, which include estimated payments on stock income and the like, and are out in front these days. Recently, when discussing growth in withheld receipts with our revenue contacts, we’ve been hearing from some: “Where are those wages we keep hearing about? Maybe here: profits are up far more than wages in this cycle—almost three times as much. And that’s a real issue in our debt-laden economy, especially at the low end. 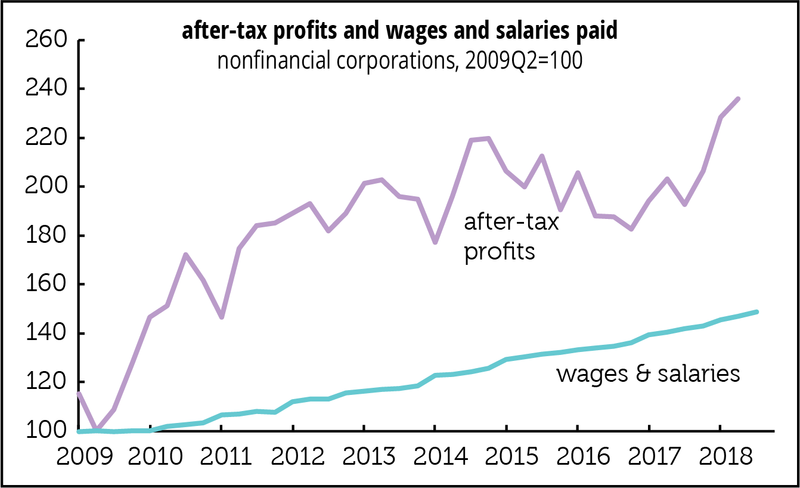 Since mid-2009, nominal wages are up by 49%—but profits are up by 136%. (It’d be nice to present real measures but choosing the proper deflators would be a fatal challenge.) For a while, it looked as if profits had peaked in 2014, but they’ve made a healthy recovery since. And they got a splendid boost from the tax cuts. The other day, Kevin Hassett, chair of the Council of Economic Advisers, dismissed concerns about slow wage growth by saying that if you deflated average hourly earnings (AHE) by the index for personal consumption expenditures (PCE) rather than the consumer price index (CPI) earnings look a lot better over the last year. And, he added, it’s a mistake to look only at direct pay because a lot of raises are going into benefits. There are two problems with his argument: first, AHE have looked a lot better if you deflate them by PCE for most of the last three decades, and for second, benefits are running only slightly ahead of wages in the private sector, and rather behind overall. Here’s a comparison of yearly changes in the two inflation measures. In 88% of the months since 1990, the CPI came in above the PCE. And here’s what AHE look like when you deflate them by the two measures. Since the all-private series only begins in 1964, and the all-worker series in 2006, we’ve chained nominal wages from those two series together with manufacturing (which go back to 1939) to produce a long-term measure. 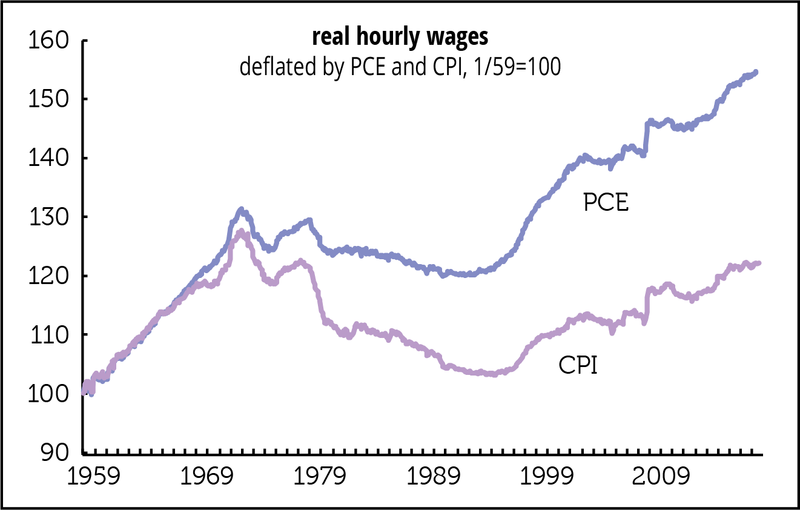 Using the CPI, real wages are 4% below their 1973 peak; using the PCE, they’re 18% above. We’ll leave the topic of which is the better measure for some other time. 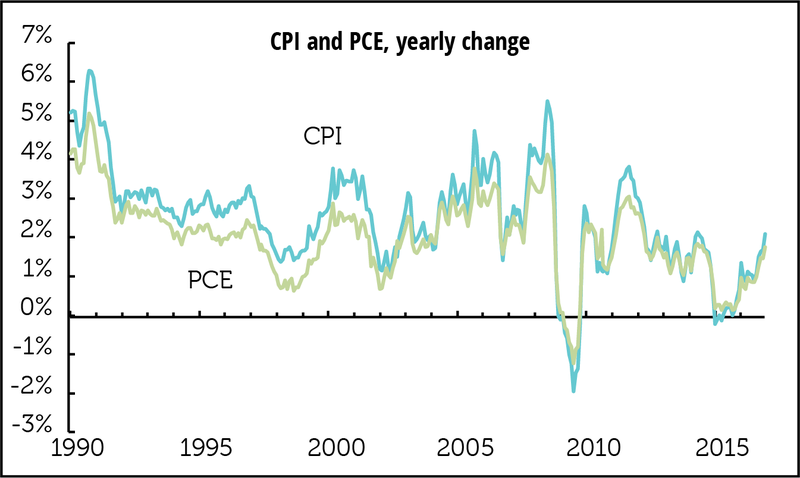 But any recent outperformance of real wages using the PCE rather than the PCI is a very old story. Finally, benefits aren’t doing that great. 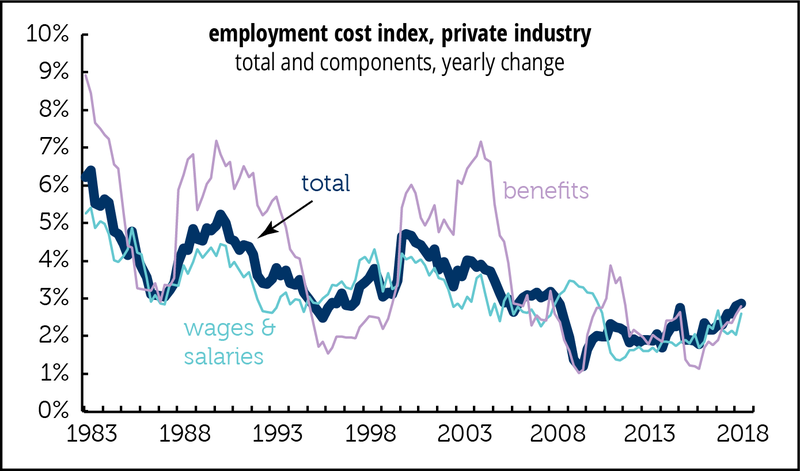 Here’s the history from the Employment Cost Index (ECI) series. Overall compensation growth in the second quarter was at the high for the cycle—but it’s below early troughs, like 1987, 1995, and 2006. Benefit growth is only slightly above wage growth, and is nothing compared to the bulges seen from 1988–1993 and 2000–2005. A major reason for this is the deceleration in health costs. Employers’ health costs were up just 1.5% for the year ending in 2018Q2, a third the 2010 average of 4.8%, and less than a fifth the 2000–2006 average of 8.2%. Health insurance costs are now lagging overall medical inflation; they exceeded it in the early periods by a wide margin. That suggests employers are shifting more costs to employees. 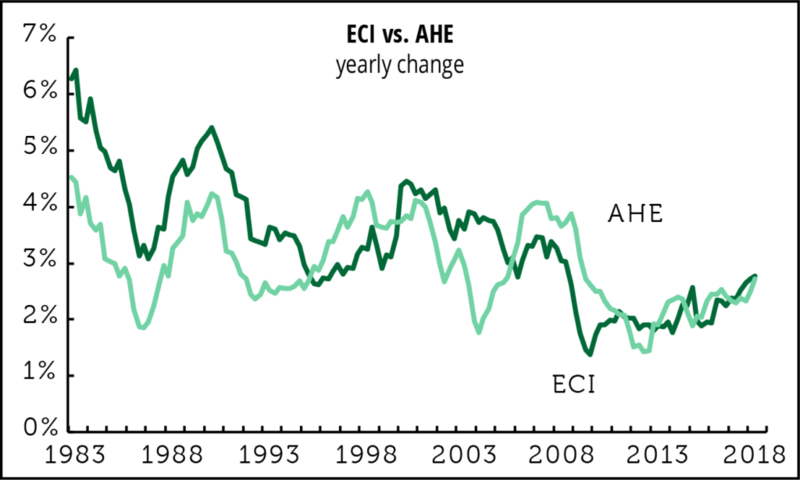 By the way, here’s what the ECI looks like compared to AHE. We don’t recommend making a habit of using the ECI as “truth.” When we asked an economist at the Bureau of Labor Statistics some years ago what he thought of substituting the ECI for AHE, he said, “If you use that wrench, you’re going to strip that bolt.” Kevin Hassett may need to visit his favorite hardware store.